Check out the Chords and Lyrics for "Under the Boardwalk"
Play along with the ukulele cover of "Under the Boardwalk" (The Drifters) performed by Aldrine and his baritone bestie "Kaniho" Randell Giminiz on the guitar. This one is pretty simple, just follow the chords and the basic rhythm of the song to play along. If you need some extra help learning this song, start with STEP 1 below. And if you want even more "Under the Boardwalk" fun, check out our Aloha Friday Jams (every Friday at 1PM HST). This tune might not be a regular on our jam list, but we do bring it out for special occasions. Practice holding each chord and memorize the names of each chord. When you can see the name of the chord and instantly know how to hold it, you're ready to move on. Now that you can hold all of the chords and know them by name, you need to be able to switch chords smoothly. 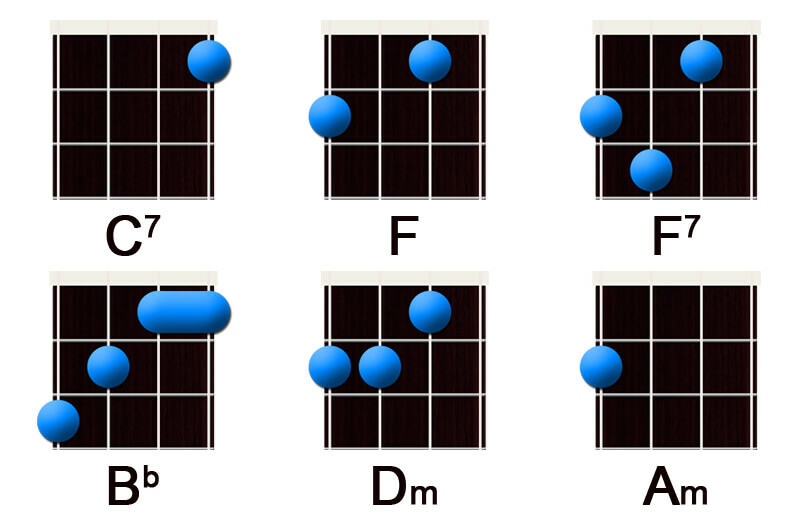 For the most part, these chord switches are pretty simple. The hardest of the bunch will probably be the F7 to the Bb. Spend a little extra time practicing the transition between these two, then do your best to play along with the chord switching video below. Switch to the next chord right on time along with Aldrine. Once you can hold the chords, switch between them, and play them at the right times, you can already play the song! Go back to the Play-Along video at the top of the page and play through the whole song, holding the chords and strumming them at the right times when they change. Easy peasy! You've just played the beginner version of this song. Now that you're able to switch to all of the right chords at the right time, you can focus on your strumming hand. Hold the F chord and practice strumming along with the video. Aldrine starts off with simple down strums and gets progressively harder, adding in accents and eventually rolls. If at any point the strumming becomes too difficult, just keep strumming the last rhythm you felt comfortable with. When you're ready, you can retry this video and work on the next rhythm until that becomes natural to you. Once you can play along with the basic strumming or even more complex strumming for the song, you can now add another piece to the puzzle! Go back to the Play-Along video at the top of the page and play through the whole song, switching through the chords and playing the strumming rhythm that you learned. You can play the chords and you can play the rhythm, now let's spice it up with some picking. The picking for this song is a simple harmony riff. Play along with the video below trying your best to match the notes and rhythm. And that's it! Once you can play all the way through the chords, rhythm, and picking videos, test your skills by playing along with the Play-Along video at the top of the page. If you're a beginner tackling one of your first songs, congratulations! It may have taken a lot of work, but you just mastered 6 chords, a couple of different rhythms, and you get to add a really awesome song to your repertoire. If you have any questions, we're always here for you. Keep learning and keep strummin!